We built a greenhouse in our second year here. The amount of food we can harvest from growing in the greenhouse is definitely worth it. We can’t grow tomatoes in the garden here without this extra protection. Preparing the greenhouse for planting is one of the first things we do in the Spring. 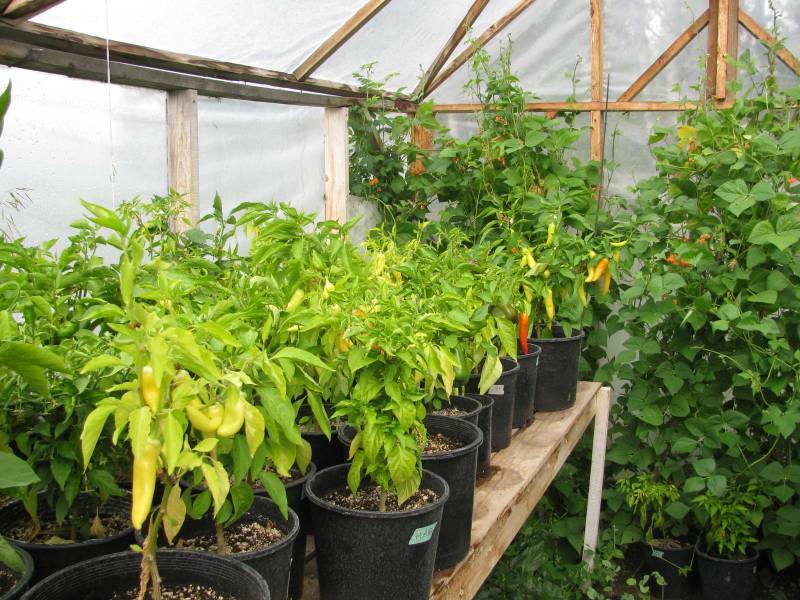 Each season, there is some greenhouse maintenance that has to be done. Here’s what we do to open the greenhouse for the growing season (and also how we protect it for the winter). 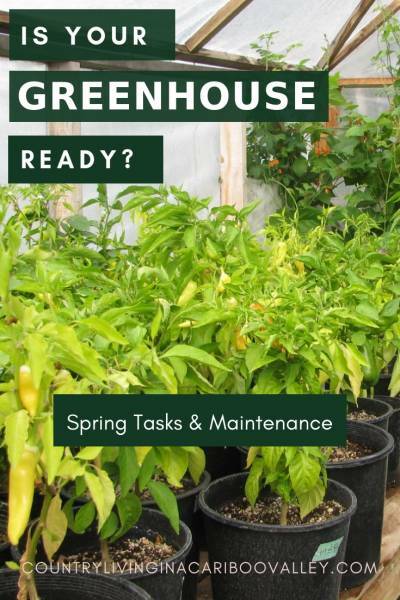 Each Spring, there is work to do in order to get the Greenhouse open and ready for vegetable seedlings. The tarp we put on for extra protection in late Fall needs to be removed, folded up and stored for the season. We save and recycle used bleach jugs for a couple of reasons. We fill them with water (not quite full) and tie them to the tarp. This gives us the extra weight we need to make sure the tarp doesn’t come off in the winds of fall. So in the spring, they have to be untied. Now we are going to use them inside the Greenhouse for the coming growing season. Cracked jugs (from cold winter weather) get thrown out and the others get a new coat of black spray paint. Then they get refilled and placed right alongside the new transplants. This way the water warms up in the daytime from the sun. At night it releases that warmth and helps to keep the transplants warm. Here we have pole beans growing in the greenhouse. 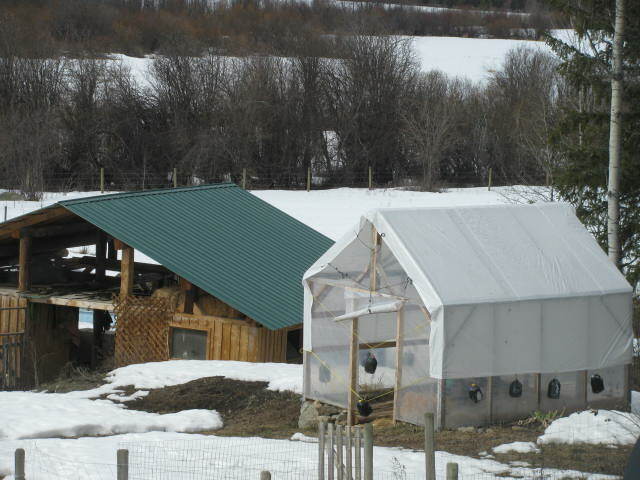 After the tarp is taken down and the jugs taken care of, I open up the greenhouse door and take a look to see how it fared over winter. Cleanup gets done, unless it had been completely done in the Fall (not usually). Any native plants that got in there after we closed the greenhouse up, are dug out and composted. Then I dig and loosen all the soil. We have pretty good soil in here because it gets amended. 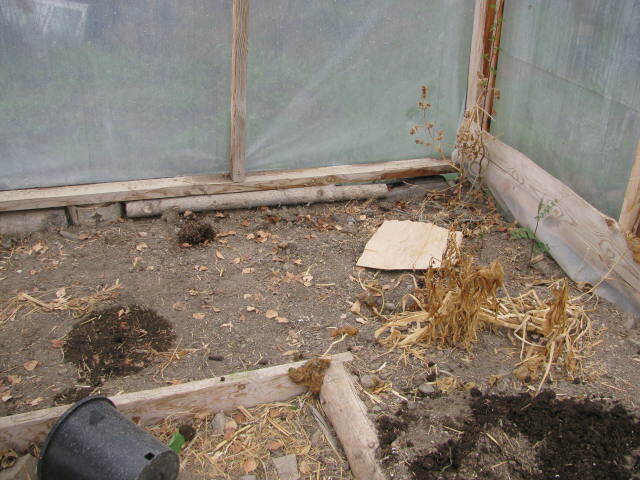 Improving the soil is an important part of preparing the greenhouse for planting. This load is all composted manure – each year I add more to these beds. 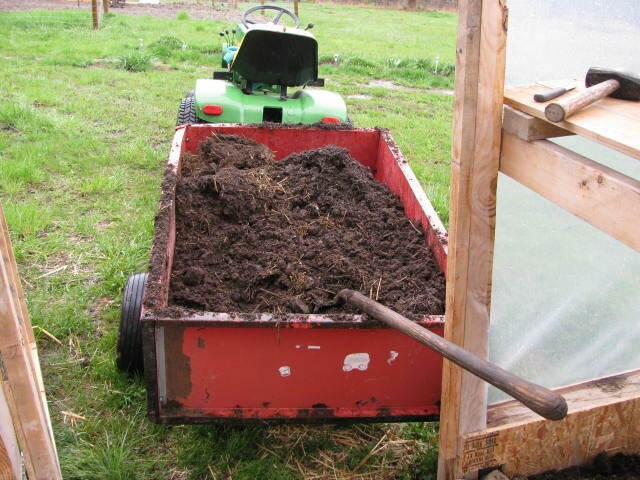 I use one trailer load of well composted manure and shovel it onto the beds in the Greenhouse. Then I lightly dig it into the existing soil and the ground is ready for planting. I always make sure to water the beds heavily before planting; this soil is very dry and it can take a couple days of watering before it is ready for plants. 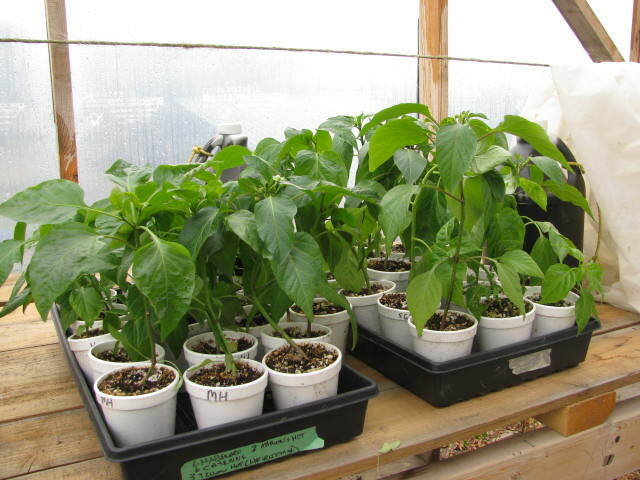 Since we don’t heat our Greenhouse, we don’t use it as a place for starting seedlings – but it is a great place for hardening off some plants. I can tuck the Peppers and Tomatoes in here a week or so before they need to go in the soil. It frees up a fair bit of room in the house, so I can get the last batch of seedlings out of the basement. We started these Peppers in our basement seedling room. Now they have been hardening off here in the Greenhouse for 3 days. I have been covering them with Remay cloth in the evenings, as it is still pretty cool here overnight. There’s a nice mixture of Red and Green Sweet Peppers and lots of Hot Peppers. We should get a great harvest to use in making our homemade Salsa and pickles. 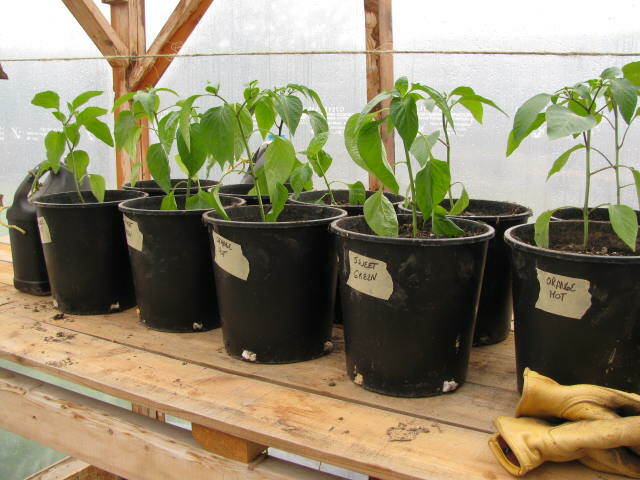 Some of the Peppers are transplanted into large pots. They can spend the next few months growing right here on the long shelf. We can probably fit about 2 dozen large pots on this shelf. It adds a lot of growing room. Plus, it gives me a handy spot for doing seeding or transplanting. The rest of the Peppers are planted in the ground directly underneath. Since the plants don’t grow very tall, there is lots of room for them under here. And it gets full afternoon and early evening sun, even under the shelf. And Graham built a new sturdy door – it has chicken wire laid over it. We needed a new door, but it has to be “open” enough so bees can get in. Using the chicken wire allows that! This new door will keep our free ranging chickens out, plus keep our cat, Ginger. She seems to like curling up in the corner in the warmth of the sun. We want her to stay out and spend her time down at the Barn chasing mice. And leave our plants alone! 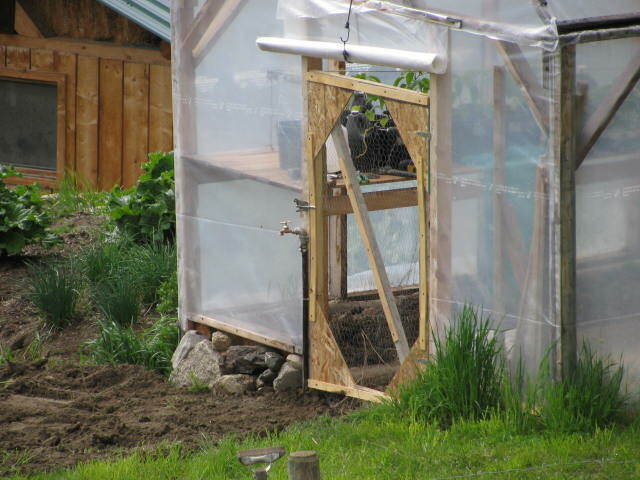 Since we dug a water line and put in a tap right there at the Greenhouse door, we can just turn the water on. As soon as the weather is willing and the transplants are strong enough, we can start planting into the ground inside. We usually water by way of a drip system or a long soaker hose. Preparing the greenhouse for planting is an important part of beginning the gardening season here. We know that if we do the regular maintenance we have a much better chance of success in getting a large harvest of tomatoes, peppers and beans. 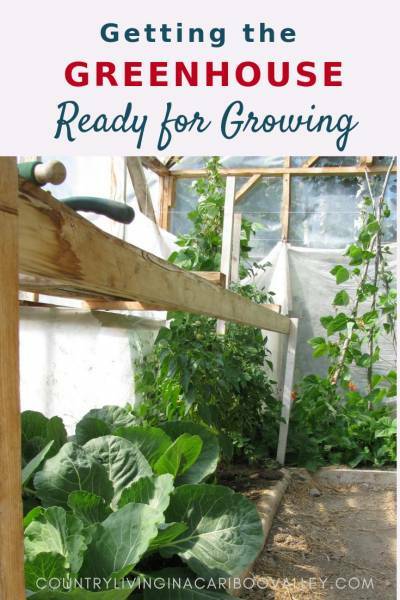 Want to read about how we built our Greenhouse on the cheap? 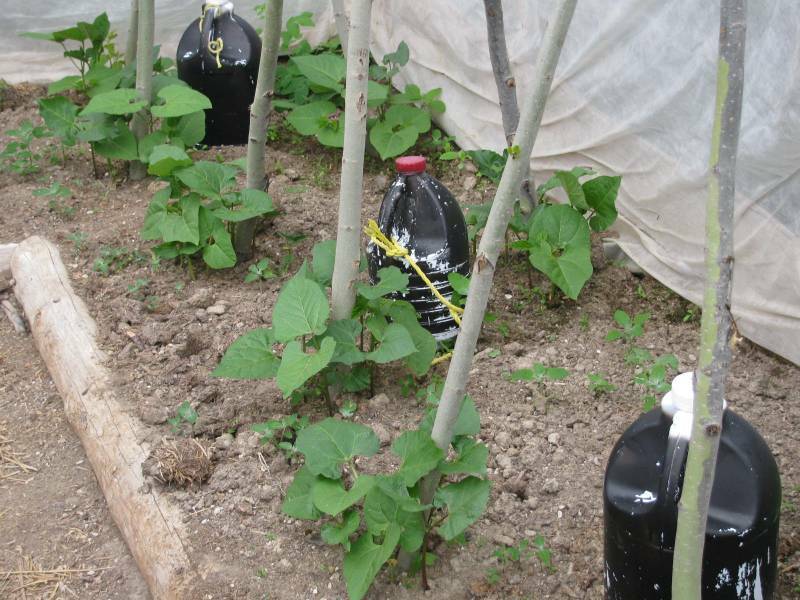 Read about how we grow pole beans in the Greenhouse! We like to grow Scarlet Runner beans because we always get a heavy yield. Here’s how to pressure can green beans – we can about 4 dozen every year. This way, we can grow them cheap and eat them all winter. We save hundreds (maybe thousands) of dollars every year by preserving our own food. No need to buy fresh vegetables in the winter when the stores raise their prices so much. Here are several ways to preserve food – try one or more of these options and save money at the grocery store. Ah mom you mean Ginger has to work this year…. Love the greenhouse wish I had one. One thing though with your corn planted in there does it get pollinated enough. It is wind pollinated isn’t it. Oh and Ginger just told me to let you know there are mice tiring to get in the greenhouse and she needs to guard it.